For the last couple days, I had a craving for lemon bars. 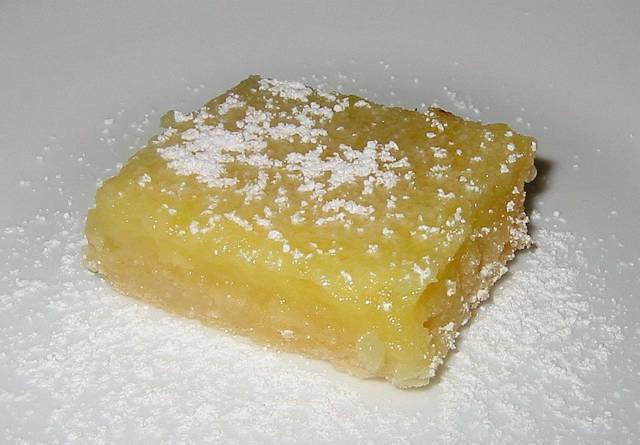 Lemon bars are sweet lemony cookies that have a gooey top and a shorbread base. Throughout high school I ate a lot of Lemonheads which are sour lemon hard candies. Perhaps because of this, I like to have my lemon cookies to have a nice and strong lemon flavor. The best recipe for lemon bars I've found is from Baking Illustrated. It is also a simple recipe to execute. Line a 9x13&nbsp;in. baking pan with parchment paper. The easiest way to do this is to rub some butter on the pan and place a sheet of parchment paper down. Then put some more butter on the parchment paper and place another sheet of parchment paper down perpendicular to the first sheet. 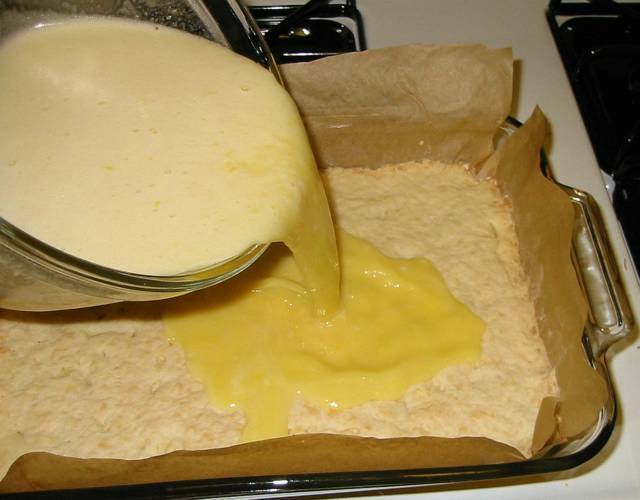 This will line all the sides of the pan and not have lemon bars stuck to the side. In a food processor with steel blade, combine 1-3/4&nbsp;cups all purpose flour, 2/3&nbsp;confectioner's sugar, 1/4&nbsp;cup cornstarch, and 3/4&nbsp;tsp. salt. Pulse a few times to mix. Cut 3/4&nbsp;cup unsalted butter into 1&nbsp;inch pieces and add to processor bowl. Process until the flour forms a coarse meal texture (about 12 seconds). Pour the flour mixture into the pan and spread evenly. Using your hands, press down on the flour mixture and compact it evenly to produce a consistent thickness of about 1/4&nbsp;in. If you like, you can press the mixture up the sides of the pan about 1/2&nbsp;in., but I don't bother. Refrigerate the crust for thirty minutes to firm it up and then bake at 350°F until golden brown (about 20 minutes). While the crust is baking, throw together the filling. 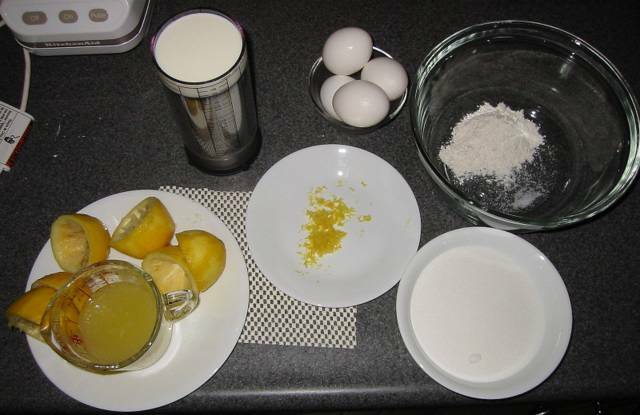 We'll be using (from left to right) 2/3&nbsp;cup lemon juice, 1/3&nbsp;cup whole milk (do not substitute), 2&nbsp;teaspoons lemon zest, 4 large eggs, 1-1/3&nbsp;cups granulated sugar, 3&nbsp;tablespoons all purpose flour, and 1/8&nbsp;teaspoon salt. 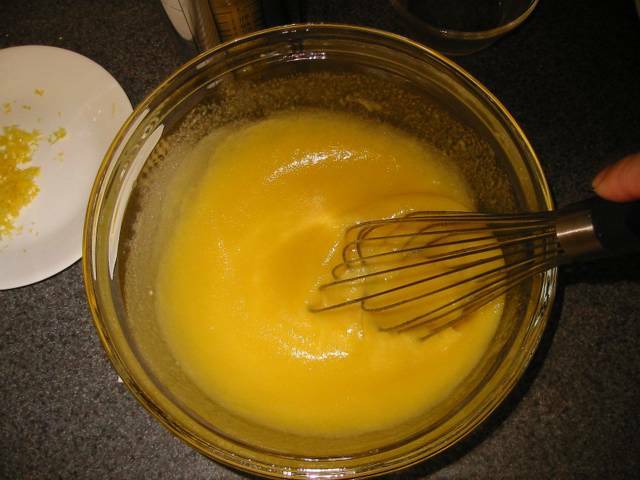 Stir in lemon juice, lemon zest, and milk until well blended. Once the crust is done baking, stir the filling once again to make sure it is well blended. Pour filling onto the still hot crust. Bake until filling is firm to the touch (about 20 minutes). Remove from the oven and allow to cool to room temperature on a rack. 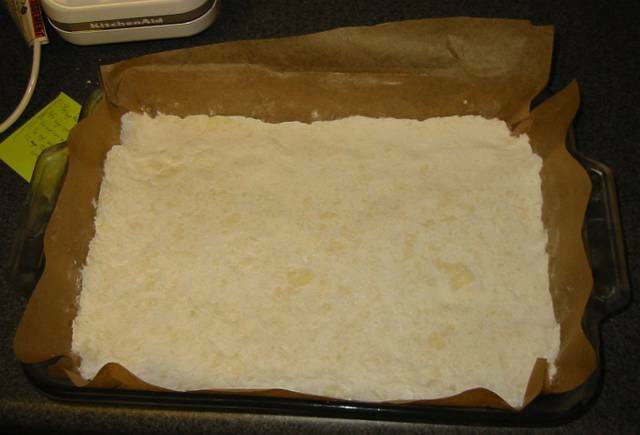 After the lemon bars have cooled, lift the bars out by grasping the free ends of parchment paper and place on a cutting board. Use a pizza wheel or knife, cut into bars. I prefer to cut smaller bars (32 of them) because the filling is quite rich and strong. If desired, serve with confectioner's sugar liberally sifted over the bars. Seal uneaten bars in plastic wrap and consume within two days. if the recipe is from a book, is it considered fair use to reproduce on the web? I don't know. That's a good question. I'm pretty sure it's not okay to copy the text from someone else's book without permission, but since I executed the recipe from the book and then wrote about how I executed the recipe, it might be a slightly different case. If you look at Baking Illustrated, you'll find the recipe differs ever so slightly because I found it easier to do certain things in a certain order and it still worked. I will have to find out about that - time to send an e-mail to Cook's Illustrated. So, Cook's wrote back and said it was okay so long as I credit the source and include the correct recipe. If I alter the recipe, it should be clearly stated. Hi Michael, it's Lynn from Orkut's cooking community. Just snooped around your website per your invitation to do so. You've highlighted some recipes I'm already eager to try. Thanks for that. I really like that you have also posted pictures. Firstly, I love how you rpesent the recipes - the table format is a unique (to my knowledge), compact and sensible way of presenting recipes. I have a FANTASTIC version of lemon bars that has whole cranberries added as a top layer. It's like eating sweet & sour condensed milk lemon heaven! Email me at thisisnotablog@gmail.com if you're interested. Recipes are not copyrightable under US law. Well, you're half right: "Mere listings of ingredients as in recipes, formulas, compounds or prescriptions are not subject to copyright protection." "accompanied by a substantial literary expression in the form of an explanation or directions, or when there is a combination of recipes, as in a cookbook." Great recipies. Copyright the table format and write a book!! This seems like a job for patents, not copyrights. In my layman's view of how intellectual property law works, I imagine that Michael can copyright one particular table (e.g. 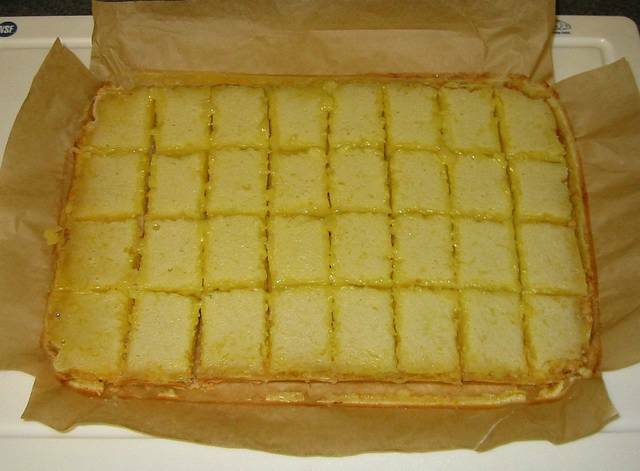 this one for lemon bars) or patent the system of displaying a recipe in tabular form. Any actual IP attorneys care to set us straight? Yes, that's on my things to think about how to do correctly and easily. Without changing how I post articles, I can't think of a simple solution to presenting U.S. and metric sizes. I don't want to burden myself with too much extra work when writing articles because I know that as soon as it stops being fun and becomes a chore, I'll stop writing. Recipes *are* copyrightable under U.S. law. Just like any other literary work. But, only the description in the recipe can be copyrighted, not the actual recipe itself (i.e. the process itself). Thus, if you can find a different way to describe the same idea (Mom's Lemon Bars) then you're likely fine. A narrative description of how you went about putting together lemon bars might be enough, as might reproducting the recipe in table form. But who really knows what a judge will decide without caselaw... but given the relatively low creative content of a recipe description and how closely the description is tied to the process itself, there's probably a lot of leeway in how much of the description of the process you can use without it being infringement. Quickly wash the lemons in hot tap water to remove the thin coating of carnauba wax. Remove the zest (yellow part of the rind) from the lemons. Be careful to leave as much of the white pith behind as possible, as it will impart a bitter taste to the finished product. Place the zest in a quart jar that will accommodate a tight fitting lid. Pour the vodka over the zest, tighten the lid, and place in a cool dark place for 14-20 days. After the allotted time, strain the vodka through a fine mesh sieve into another container. The zest should be a pale, washed-out, light yellow. Place the pallid peel in a pan, add the cup of water, then the cup of sugar and bring to a boil. Stir to dissolve the sugar completely. Strain the resulting simple syrup through a fine mesh sieve into the reserved vodka. Stir. You will end up with slightly more than a quart of lemony goodness. Place the liquid in a suitable container. Limoncello benefits from a period of aging, during which the flavor mellows somewhat. Serve ice-cold directly from the freezer in little jelly jars from Hickory Farms. It is best to make a double batch, since your friends and relatives will probably drink most of what you make, even though when you first brought it out they thought “Oh Boy, here we go again! Another weird idea from the Wizard of Odd”. But you showed them as they smacked their lips and asked for seconds…. Combine all ingredients and stir to thoroughly mix. Adjust sugar to taste. Serve over (this is the classy part) fresh-chipped hormone-free Canadian glacial lake ice in a chilled hand-blown lead-free glass with a swizzle stick made from organic free-range union harvested sugarcane. This is especially good topped with a shot of Limoncello.